"Earth" / "Fossil" / "The Ancestors" / "Relic" all are personal favorites. But the entire LP has incredibly strong work. This album is beautiful in its own way. The tribal samples often remind me of early Bandulu works, maybe because of the tribal feeling. But that might be just be. There is one particular song on this cd that really puts all of the other songs together in the concept. And its "Life". Its a beautiful, strange, and yet, addictive electronic song, that starts out like if its played in a market in Africa or something. Then it develops, like if it was spiritualy moving away from the people, and focusing the mind on this strange tribal woman's voice, dipped in this ethereal synth pad, that develops into a repetitive tribal rhythm. This track is the one that makes this album a whole concept, and makes you think "wow, this was worth listening". Indeed, similiraties between Mills and Ho are apparent on "Universal", although Laurent is light years away from matchnig Jeffs sci-fi techno. This album features loads of tribal and funky tracks, with repetitve loops and (mostly female) vocal snippets, sometimes even making excursions into tribal chants and so forth. Personally, I don't find myself at home with this album. The tribal influences reminisce too much of Mills' Purpose Maker material, while the, admittedly good though, eerie melodies are an obvious nod to the Detroit's wizard stuff on Tomorrow. As the reviewer before me mentioned, Parade is an awesome piece of ambience, with a catchy lead. Same can be said about the beautiful opener Earth, which starts as a beatless journey, builds before transforming into a groovy, drum driven techno bomb. Overall, I am not that impressed. "Universal" draws ideas in from all over the place, but my honest two cents is that the same combination is constantly getting pulled through the album. Maybe I should get more acquainted with more of his work, because the way things are, this is not an album I'd like to remember him for. Having that said, the overall production in tight, there is enough drive and juicy bass lines to make this one stick in many a DJ cases. In fact, hearing these tracks mixed in with similar material must make 'em come across twice as effective as listening to them on repeat in their unmixed versions. I get this sensation of my CD player being broken, having a single loop on repeat for 4-5 minutes. Maybe you'll feel different, give it a try however. 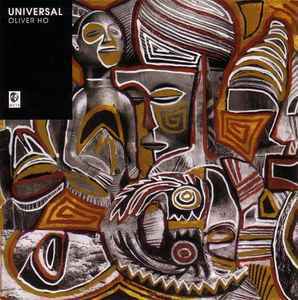 Oliver Ho's fifth full-length effort follows in the footsteps of his Listening to the Voice Inside with a selection of jack tracks whose tribal thumps and clicks are cut with a series of disembodied vocal samples. Unlike his singles, however, though this groundswell of robotic grooves undeniably dominates this work, Ho is at his best when satisfying his well-documented art aspirations with the occasional acid-rain-washed slice of ambience, or the cautious strings of "Parade," which wander through a blistered landscape of jazz samples guided only by an eternal bass loop, providing a murky vision of the future comparable to that of the master of this form of music, Jeff Mills. This is one of my favorite double pack I own. It almost seems all these track are from the Earth. The sounds and beats are all natural. Must Buy.